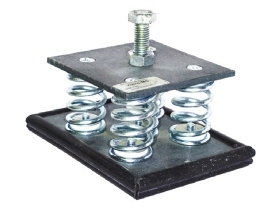 Vibro-MS.wm is an anti-vibration mount, with multiple free standing springs. Within the internal diameter of the coil spring there is a resilient cushion knitted stainless steel wire mesh. 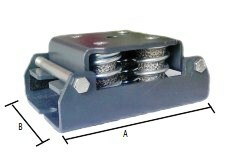 Vibro-MS.wm is a wire mesh vibration damper, with multiple free standing springs. Within the internal diameter of the coil spring there is a resilient cushion knitted stainless steel wire mesh, which is the differentiation between the Vibro-MS and the equivalent wire mesh vibration damper VIBRO-MS.wm. This wire mesh vibration damper has multiple free standing springs in order to be suitable for a wide range of machinery. The springs are fixed with an innovative fastening system. The internal metal cushion reduces the amplification at the natural frequency and increases the damping factor. If the application is not exposed to high temperatures, it can be equipped with rubber profile at its base, that acts as a sound break and increases the isolation efficiency in high frequencies, that could be transmitted through the springs. It can be upgraded to Vibro-MS.wm complex, with the addition of antivibration polyurethane foam sheet with trade mark Regufoam® underneath its metal base. Vibro-MS.wm is used for low frequency vibration control and especially in cases that the usage of multiple springs is necessary for greater stability. It can be used for vibration isolation of mechanical equipment in military, marine and avionics applications. Vibro-MS.wm performs well in tough environments. For more information regarding our complete range of wire mesh vibration dampers, please email us at info@vibro.gr and we will be happy to assist you in choosing the most effective vibration isolation system to prevent structure-borne noise transmission through mechanical equipment. The wire mesh vibration dampers are more applicable in marine, defense and industrial applications, that high temperature and fire resistance is required.